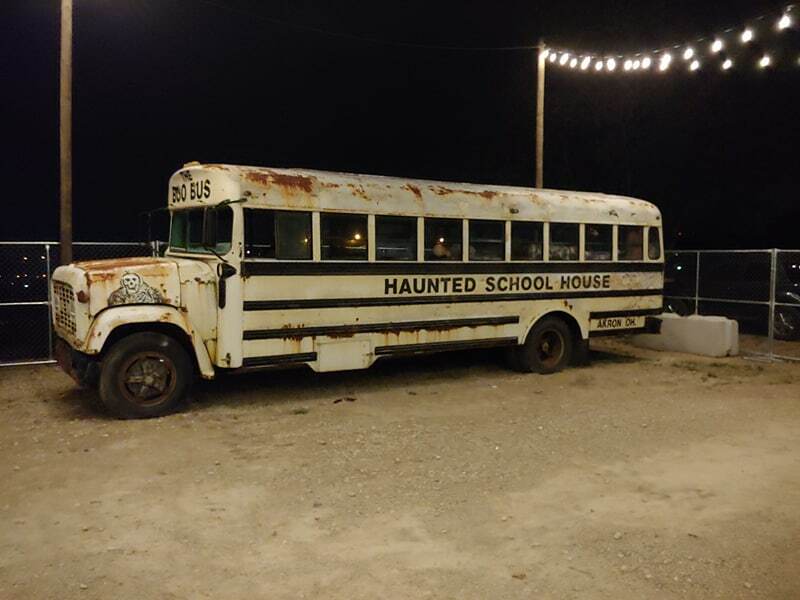 Team Jefferson Starship reviewed this Haunted Attraction on October 12, 2018. 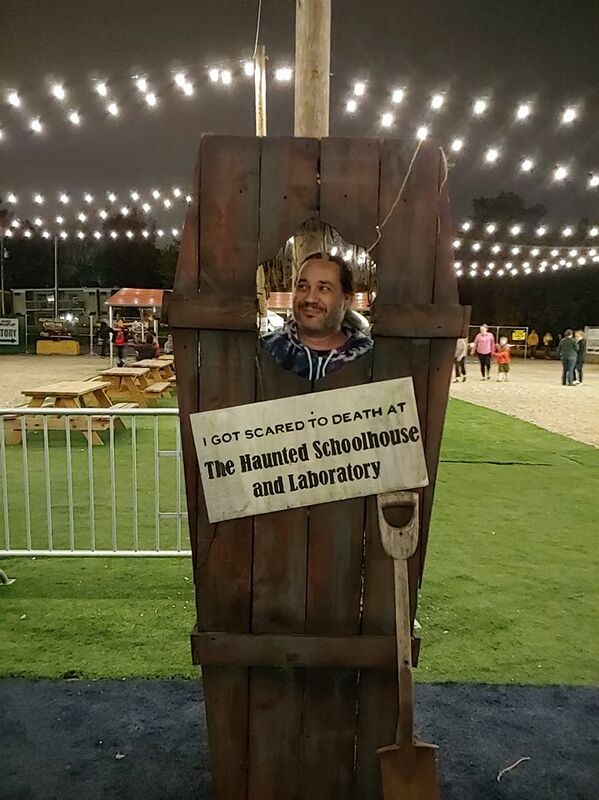 The Akron Haunted Schoolhouse and Laboratory has been serving up screams in the Akron community for the last forty-five years. 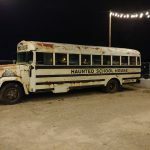 Located in a unique and historical location, the Schoolhouse and Lab utilize the history of their two buildings to create a one-of-a-kind story that is translated through talented actors and incredible special effects. 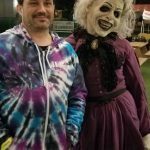 With many scenes being updated since the acquisition of Akron Schoolhouse and Lab by the team that built the Factory of Terror, it’s an unmissable attraction in the area. Wear comfortable shoes, prepare to climb many stairs, and look forward to seeing things you will see nowhere else in the world hidden behind corners, in dark rooms, and arching across thin metal mesh protection. With anywhere from 65-80 actors a night, the massive Schoolhouse and Laboratory buildings are teeming with monsters to scare anyone that wanders too far into their territory. From the moment you meet Ms. Alvah the librarian and step into her world of horror story monsters, there is a wealth of personalities to see. Despite the updates, there is still the legendary Bones slinging wit and sass from his porcelain throne which is always a joy to experience. 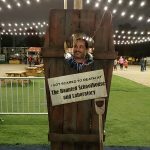 The Keymaster in the schoolhouse had a fun but frightening approach to handling guests as he manipulated their world from his booth. In the basement a number of different characters hide in the darkness including one fully equipped for fallout that held supernaturally still. A special shout out from our team to the Pumpkin King who drove one of our members back to the wall with his enthusiasm. In the laboratory we were impressed by the acrobatic crows, a scientist and his pets, and a fairly stinky monster who had befouled his tiny space and fled to join us. Doug, one of our team leads, was delighted at how bloody serious a certain doctor was in a morgue in the lab along with a silent stalker moving through a sea of twitching limbs. When dialogue is utilized here, the actors wielding it are certainly sharp and prepared. When interacting with a cafeteria chef that had gluten-free options for our wheat allergic Desi and hungry monsters in the basement with their table of delights, we were happy to see a variety of actors that stayed in character and adapted to their clientele. School marms are dressed severely and given harsh and foreboding makeup throughout the Schoolhouse as they monitor your progress past monsters dressed in realistic radiation outfits with gas masks and dark denizens from the stark pages of Ms. Alvah’s books. People-sized crows, simian doctors, and highly contagious lepers haunt the Laboratory and all its hideous experiments. There is a large collection of very detailed and impressive masks in both buildings and period or genre-appropriate costumes that highlight and detail the actors as they move from visitor to visitor. The staff at Akron Schoolhouse and Laboratory are highly trained and easy to find thanks to their t-shirts and walkies/earpieces. There is no shortage of people that can assist with directions, parking, merchandise purchasing, or questions and concerns. The Haunted Midway in between the two buildings holds concessions, a small bar, and seats for parents to wait for free and people to take a breath from the fear. There are also places to take group and singular photos and a live Like counter for Facebook at the entrance of the Schoolhouse where you can watch it react to your interaction with their social media page. Information on the haunted attraction is easy to find on their website as are ticket sales. Safety is respected as stairwells are lit and no haunters scare visitors on them. Signs are all visible and well-marked and emergency exits are easy to find and ample. Uniformed police officers are also on site to make sure patrons are safe and protected. From a sizable distance in either direction on Triplett Blvd., you can see the two looming, old buildings of the Schoolhouse and Laboratory. Lit by spotlights, and occasionally by man-made lightning, there is little question on whether this location is a haunted attraction and if not, it’s at least haunted for real! Waiting areas are well lit and full of themed decorations. Actors prowl both queue lines and the Haunted Midway keeping guests on edge and the energy high. Between the Schoolhouse and the Lab, there is a world of special effects to look for in the set design, props, and animatronics. Sound effects in both houses are well-placed with minimal bleed. The noises coming from one particularly hungry clown set the group behind us into hysterics and left us gushing for some time. Music is used appropriately both setting the mood and fitting the scene. Story pages have been crafted to highlight the theme of the Schoolhouse, setting a transition and creating a narrative that is very unique. A giant Tesla Coil (Irreplaceable and found nowhere else we’ve heard of), raises tension and electrifies the atmosphere of the Laboratory. Textures in set pieces are lovingly crafted and detailed, belying how new many of these scenes are. The classic Church and Graveyard that hold the memory of one of the men responsible for making the Schoolhouse’s reputation has been lovingly restored and cleaned up. A hall dedicated to restless leg syndrome in the Laboratory set our group into twitching and staring. While the two houses have very different themes, each are appropriate not only for each building’s historical significance but also for the house within. The Akron Schoolhouse goes through the mad collection of horror stories collected by the terrifying Ms. Alvah. Each room fits within this framework, and keen-eye visitors will notice that the new set dressing separating rooms with pages connects to the scenes they are approaching in some way. In the Laboratory, a former NASA testing facility for research on astronaut monkeys, the building’s imminently creepy and real-life history is explored to its most fantastical possibilities. Visitors will be hard pressed to find other haunted attractions with such an impactful weight of history behind them. Scares at the Akron Schoolhouse and Laboratory cover nearly the entirety of the horror spectrum. From well-placed set pieces and actors creating distractions to silent lurkers following us from room to room, there’s a little bit of everything here for you to enjoy as well as their impressively built and crafted special effects. Some of the scares in the Laboratory tend to be front heavy, but in most places they are spread evenly across your group. The Schoolhouse’s finale is seriously good, scenes building in tension as you make your way to the exit. On top of all of that, the leader of these merry monsters is very firmly against dead end dialogue options like “Get out” and monitors for them constantly. This makes sure that the more repetitive and boring, old-school haunt tricks aren’t being employed here. The groups in front of and behind us were screaming and running, and the group behind us almost stampeded our poor team lead Desi. 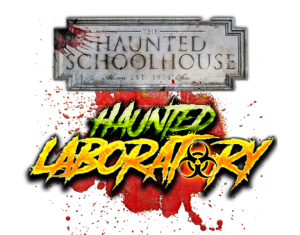 Akron Haunted Schoolhouse and Laboratory offers many different ticketing options. They also host other special events during the year. On the night of our visit, general admission was $28.00 and included both attractions. With 1.25 minutes of scares per dollar (it took us about 35 minutes to go through), this is a great value and a fun way to spend your night! Since it and the Factory of Terror are now connected, there are ticket options that let you buy tickets for both attractions including a fast pass good for both places. They also have a season pass that gives you a year of unlimited fast passes, 10% off merchandise, free parking, and discounts on up to four friends’ passes and it applies to both locations. A variety of discounts and group rate information can be found on their site. They also have it noted that you can receive free admission on your birthday! It must be your birthday though, admission is only free for the person with the birthday and a valid I.D. is required for proof.